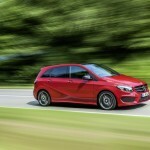 Mercedes applies a facelift to the compact van B-Class, almost at the same time as BMW releases the competitor 2 Series Active Tourer. The BMW executives don’t like the word van and gave a pretentious name to the first van in the BMW history: Active Tourer. 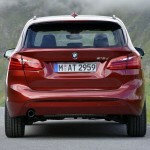 And the full name is 2 Series Active Tourer to specify that this new model belongs to the new front wheel drive family. Ok, there is a little confusion here, because the 2 Series Coupe and the Cabrio use the rear wheel drive like the current generation of the 1 Series. 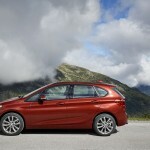 But the 2 Series Active Tourer is not only the first van in the BMW history, but also the first front wheel drive BMW in the history and it shares the same platform as the new generation Mini. BMW avoids to say that the Active Tourer is a compact van, but if we look at the footprint, 2 Series Active Tourer is very similar to the B-Class. The main dimensions are L/l/h 4342/1800/1555 mm, meanwhile the B-Class figures are 4359/1786/1557 mm. So, the Mercedes is by 17 mm longer, by 14 mm narrower and by 2 mm taller. 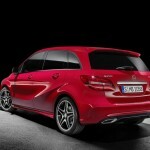 At the same time, the Mercedes has a 2699 mm wheelbase, by 29 mm more than the wheelbase of the 2 Series. Also the boot volumes of both cars are very close, with a small advantage for the Mercedes: from 486 to 1,545 litres compared with 468 to 1,510 litres for the BMW. Both cars are very practical with optional sliding rear bench and foldable backrest for the front passenger seat (separate options in the BMW, one package at the Mercedes). A little extra, the BMW offers a 40/20/40 foldable rear backrest and the possibility to fold the rear bench from a lever placed in the boot. The B-Class is at the middle of its lifecycle and already has a very comprehensive model range: four diesel engines, four petrol engines, two alternative propulsion versions and three engines available in combination with the 4Matic. The BMW 2 Series Active Tourer starts with six versions: 218i (1.5 litre turbo, 3 cylinder, 136 HP), 220i (2,0 litre turbo, 4 cylinder, 192 HP), 225i (2 litre, turbo, 231 CP available only with the automatic and front wheel drive or the four wheel drive), 216d (1,5 litre turbodiesel, 3 cylinder, 116 HP), 218d (2 litre turbodiesel, 4 cylinder, 150 HP) and 220 d (2 litre turbodiesel, 190 HP, available with the front wheel drive and the manual 6-speed gearbox or with the four wheel drive and the 8-speed automatic gearbox). 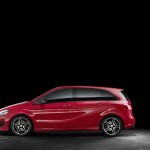 In therms of equipment level, above the base version, the Mercedes B-Class offers Style, Urban and AMG packages with the possibility of a further individualization with the Night, Exclusive and AMG Exclusive packages. 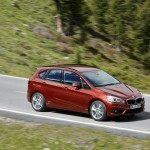 The new 2 Series Active Tourer actually offers two standard versions: the Base and the Advantage. From the Advantage the offer could be upgraded with the Sport Line, the Luxury Line and the M Sport. The price comparison is also very interesting. In the diesel field, the Mercedes start swith the B 160 CDI/90 HP at a price of 27,905.50 euros, meanwhile the B 180 CDI/109 HP costs 28,857.50 euros. 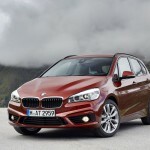 The BMW 216d Active Tourer with 116 HP is priced almost the same: 28,950 euros. 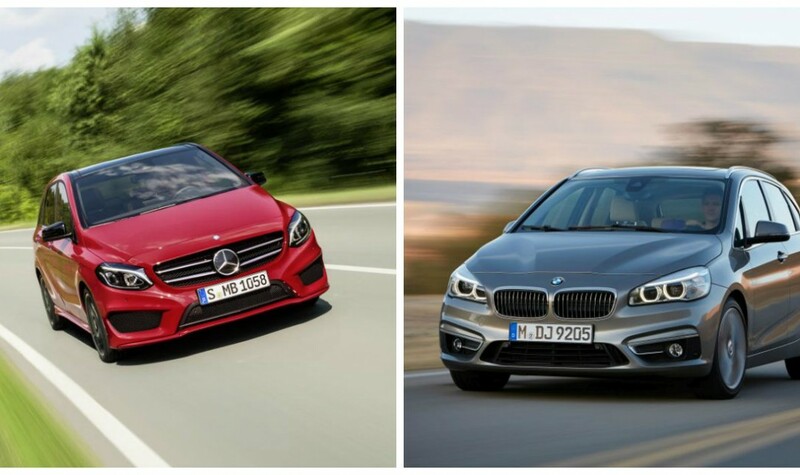 The B 200 CDI with 2.1 litre/136 HP has a price of 31.088,75 euros, while the BMW comes with a price offer of 31,050 euros for the the 218d with 2 litre and 150 HP. The top class diesel B 220 CDI 4Matic, with 4-wheel drive and 7-speed automatic gearbox costs 38,228.75 euros, as the BMW 220d xDrive Aut. has a price of 38,600 euros. In the petrol field, the cheapest B-Class is the B 180 powered by a 1.6 litre 122 HP, which finds a competitor in the BMW 218i Active Tourer with 1.5 litre and 136 HP. 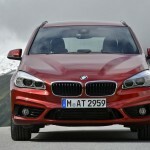 The B 180 has a price of 27,102.25 euros compared with 27,200 euros for the BMW 218i. The top version of 2 Series Active Tourer is 225i with a 2 litre turbo and 231 HP, which is available starting with the second equipment line Advantage, at a price of 37,950 euros. The compatible version from the Mercedes is the B 250, with 2 litre turbo 211 HP, available for a much lower price of 35,134.75 euros. 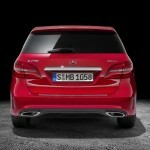 Both top versions have a 4-wheel drive version: the B 250 4Matic Aut. with 211 HP, at a price of 37,336.25 euros and 225i xDrive Aut. At a price of 39,950 euros. 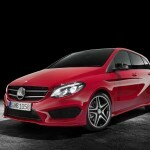 The Mercedes also offers two alternative propulsion versions one of which is electric. 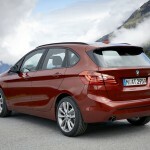 The BMW does not have an electric version or other types of propulsion for 2 Series. 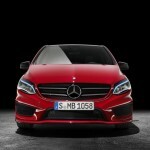 On the US market, where Mercedes sells the B-Class only as an electric version, the BMW will compete against the i3. i3, an original car with a specific design, but the Mercedes promises more space and more practicality in the 4-real door B-Class. The 2 Series Active Tourer and the B-Class facelift are already on sale: the B-Class starting September 12 and the 2 Series Active Tourer starting September 27.